University of Florida Health pediatric surgeons have published results from nearly 20 years of treating children with congenital diaphragmatic hernia, showing the highest published survival rate for a large-group study. The findings also present new data for determining when a baby’s hernia should be surgically repaired. Congenital diaphragmatic hernia occurs when one of the diaphragm muscles does not develop fully during gestation. Abdominal organs migrate into the chest, crowding the heart and lungs and impeding lung development. Infants born with CDH have life-threatening breathing difficulty. Most cases of diaphragmatic hernia are diagnosed before birth. The best modern estimate of survival at U.S. centers that treat CDH patients is 67 percent. However, this estimate may be high, in part because it does not include data on babies born at hospitals that don’t routinely treat CDH. In the period from 1992 to 2011, 88 percent of CDH babies treated at UF Health who did not have lethal associated defects, often cardiac or neurological defects, lived to be released from the hospital. An article in the October issue of the Annals of Surgery describes the UF Health team’s methods and results, achieved under the leadership of David Kays, M.D., UF’s chief of pediatric surgery and an associate professor. Kays and his team at UF Health Shands Children’s Hospital have treated children with CDH from across the world. 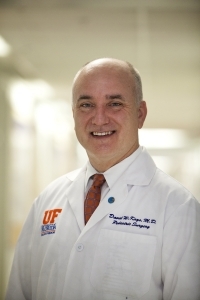 Kays began UF Health’s CDH program in 1992 after studying at Columbia University under Jen-Tien Wung, M.D., a pioneer in ventilation for newborns, and pediatric surgeon Charles Stolar, M.D., a specialist in CDH treatment. Since the program’s start, Kays has consistently employed gentle ventilation techniques to avoid further damage to babies’ lungs, a treatment that has gradually become mainstream. He and his team also have worked diligently to determine the best time to surgically repair a baby’s diaphragmatic hernia. Analysis of their data from nearly two decades of treatment shows the answer depends on specifics about the baby’s condition. In babies with a hernia on the left side of the body, which is much more common than a right-side hernia, physicians should determine when to operate based in part on whether any portion of the liver juts through the hernia into the chest. Those with a left-side hernia and protruding liver have the most threatening cases and the worst outcomes, the study results show. The next steps in the team’s research will be to determine even more precisely when to operate on infants with the most serious cases of CDH, Kays said. To do this, the team will analyze gases in the blood of the sickest babies, as well as how much of the liver protrudes into the chest, for clues. In addition, Kays said he hopes other surgeons will consider their own surgical timing approaches for babies with CDH, as well as the messages they give parents. Institutions that treat CDH should “continue to work toward better survival rates, because they are achievable,” he said.